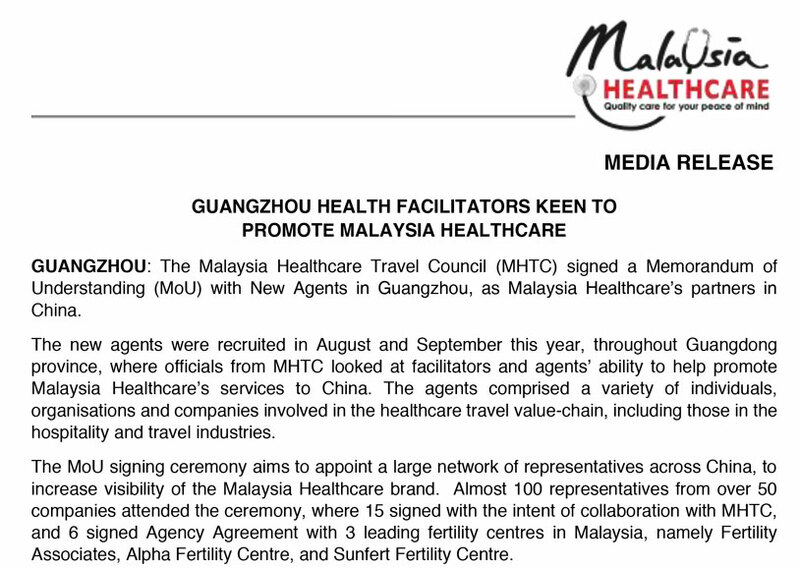 GUANGZHOU: The Malaysia Healthcare Travel Council (MHTC) signed a Memorandum of Understanding (MoU) with New Agents in Guangzhou, as Malaysia Healthcare’s partners in China. The new agents were recruited in August and September this year, throughout Guangdong province, where officials from MHTC looked at facilitators and agents’ ability to help promote Malaysia Healthcare’s services to China. The agents comprised a variety of individuals, organisations and companies involved in the healthcare travel value-chain, including those in the hospitality and travel industries. The MoU signing ceremony aims to appoint a large network of representatives across China, to increase visibility of the Malaysia Healthcare brand. Almost 100 representatives from over 50 companies attended the ceremony, where 15 signed with the intent of collaboration with MHTC, and 6 signed Agency Agreement with 3 leading fertility centres in Malaysia, namely Fertility Associates, Alpha Fertility Centre, and Sunfert Fertility Centre. Malaysia Healthcare currently operates through a single partner in China, Tai Orient, an established healthcare facilitator with excellent end-to-end services, and is a prominent player in the referral of infertile couples for In-Vitro Fertilisation (IVF) services in Thailand and the US. MHTC’s Chief Executive Officer, Sherene Azli says “From the successful acquisition of an extended network, these trained agents and facilitators could look for potential patients on behalf of Malaysia Healthcare”. 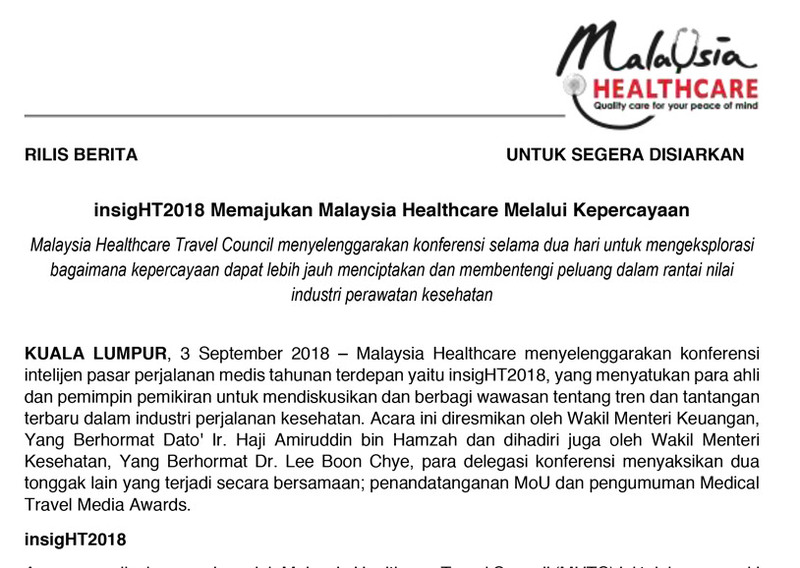 Malaysia Healthcare intends to collaborate with interested stakeholders such as hospitals, to host frequent mini-familiarisation visits to better equip new agents and facilitators on the value proposition of Malaysia Healthcare. More and more healthcare travellers from China are flocking to Malaysia for healthcare treatment. Amongst the most popular treatment sought is in the area of Assisted Reproductive Technology (ART) where Malaysia records a 65% success rate for its In-Vitro Fertilization (IVF) treatment, compared to the global average rate of 55%. “What drives Malaysia’s reputation as a global leader in healthcare are three things: world-class quality, ease of accessibility and competitive affordability,” added Sherene Azli. Healthcare professionals in Malaysia are highly qualified, receiving medical training from renowned institutions in Malaysia, the UK, USA, Australia and Europe. Stringent regulations, and standards for safety and quality healthcare are set in place by its Ministry of Health (MOH), benchmarked against the highest standards in the world. To top it off, it is easy for travellers to communicate with health professionals here, where English and several Chinese dialects such as Mandarin, Cantonese, Hokkien are widely spoken. “Malaysia Healthcare has moved from strength to strength in the last few years. The country was named “Medical Travel Destination of the Year” at the Medical Travel Awards for three years in a row (2015 – 2017) by the International Medical Travel Journal (IMTJ), and “Best Country in the World for Healthcare” by International Living’s Annual Global Retirement Index also for three consecutive years from 2015 to 2017”, commented Sherene.